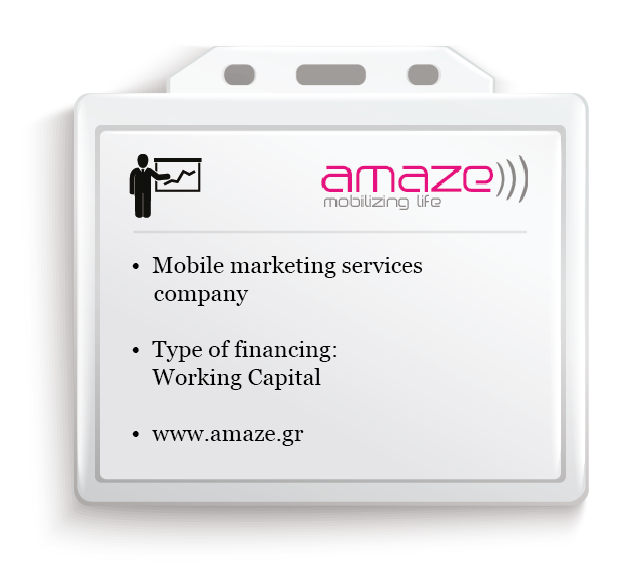 A few words about AMAZE S.A.
Amaze S.A provides mobile marketing content and contest/ voting services to TV and radio stations, mobile phone companies and directly to the end user. Like any other company, Amaze is looking for financial solutions that can help its rapid expansion. Today, the banking sector that traditionally provides financial solutions, is unable to do so effectively. An article in a financial portal led to the first contact, as CNL Capital’s offering seemed extremely interesting, and fitted the company’s needs and characteristics well. The main reason that CNL Capital was finally selected is that its financing model fits with Amaze’s commercial cycle perfectly. Collaboration with CNL Capital was a positive and rare surprise at all levels for Amaze. CNL Capital’s people have deep knowledge of the market and are very flexible and detailed-oriented. From the first meeting until the end of the investment, the whole process was extremely effective and efficient. The combination of benefits that are offered by CNL Capital to finance a company like Amaze is truly unique in the Greek market. The first funding helped the company to accelerate its growth primary in new markets abroad. For the same reason, Amaze intends to proceed with further financing. Collaboration with CNL CAPITAL was a positive and rare surprise at all levels for Amaze. From the first meeting until the end of the investment, the whole process was extremely effective and efficient.